I love the colorful peppers in this Chopped Greek-Style Salad with Red, Yellow, and Orange Bell Peppers, but you can use all one color if that’s what you have. This is a great option when you don’t have great tomatoes, and this tasty salad is low-carb, low-glycemic, gluten-free, meatless, and South Beach Diet friendly. Use the Diet-Type Index to find more recipes like this one. 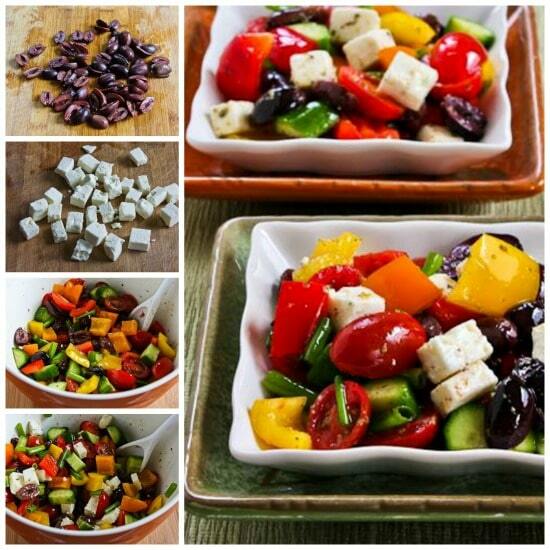 Click here to PIN Chopped Greek-Style Salad with Red, Yellow, and Orange Bell Pepper! When I went to Greece I was surprised that what I’d thought of as Greek Salad didn’t seem to exist there. Instead, every little restaurant had a dish they called country salad or village salad, which had cucumbers, tomatoes, onions, green peppers, Kalamata olives, and feta, and a dressing which always contained oregano. Now a few years later, one of my favorite Salt Lake City restaurants calls this combination Greek Salad and when it has lettuce added, they call it American Greek Salad. That works for me, and I do really like this type of chopped Greek-style salad without lettuce. When I made the Chopped Greek-Style Salad with Red, Yellow, and Orange Bell Peppers shown in these photos, I replaced the green pepper with chopped orange, red, and yellow peppers which are loaded with anti-oxidants. I used all the colors because they were on sale, but you could use just one color and it would still be pretty. I used a purchased salad dressing with some dried Greek oregano added, but you could combine a little olive oil, lemon juice, oregano and salt and pepper if you wanted to make your own. There’s no need to measure the ingredients for this type of salad, so you can vary the proportions according to your own taste. Whisk the dried Greek oregano into 1/2 cup prepared vinaigrette dressing (or make your own homemade vinaigrette if you prefer. I used about a cup of grape tomatoes cut in half, but I’d like this salad even better with chopped tomatoes fresh from the garden. I am starting to get a few garden cucumbers, but for this salad I used mostly small Persian cucumbers from Costco. I chopped the red, yellow, and orange bell pepper into bite-sized pieces. I’m not a big fan of raw onion in a salad, so I used 1 inch lengths of sliced green onions. Make it a Meal: Low-Carb main dishes like Almond and Parmesan Baked Fish or Marinated Flank Steak would be taste great with this salad for a low-carb meal. 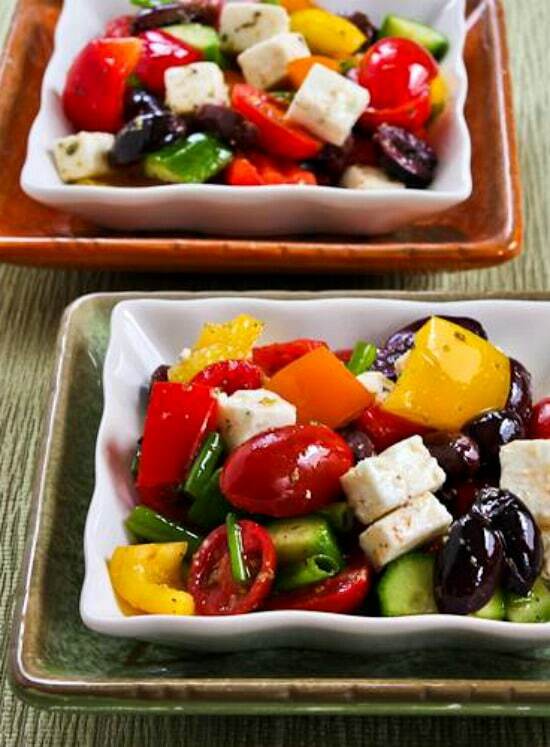 This Chopped Greek-Style Salad with Red, Yellow, and Orange Bell is bursting with flavor and color. 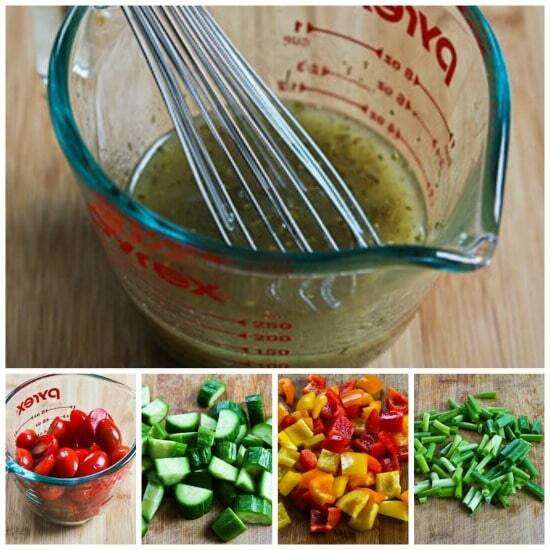 Mix oregano into salad dressing, set aside. Cut tomatoes in half lengthwise, or dice garden tomatoes. Cut cucumbers in half lengthwise, then in slices. Remove seeds from peppers and dice peppers in 3/4 inch square pieces. Dice red onion or cut green onion into 1 inch long pieces. Drain olives and cut in half lengthwise. Cut Feta into cubes about 1/2 inch square. 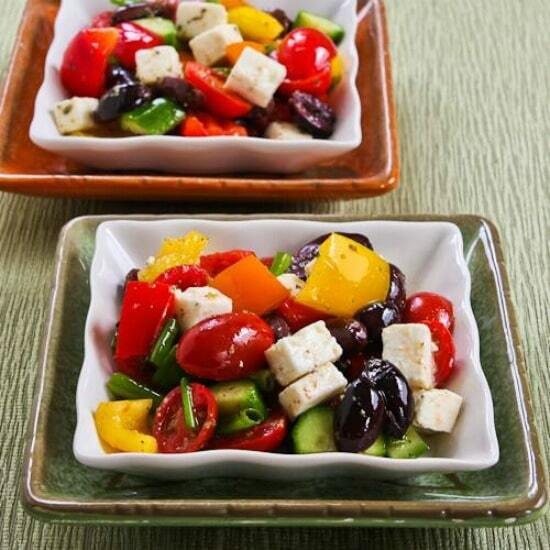 Stir feta cubes into salad and season with fresh-ground black pepper. The salad can be served immediately, but I like it best when the ingredients marinate for an hour or two. This salad keeps surprisingly well in the refrigerator for a few days. This delicious and nutrient-rich Chopped Greek-Style Salad with Red, Yellow, and Orange Bell Peppers is also low-carb, gluten-free, and suitable for any phase of the South Beach diet.